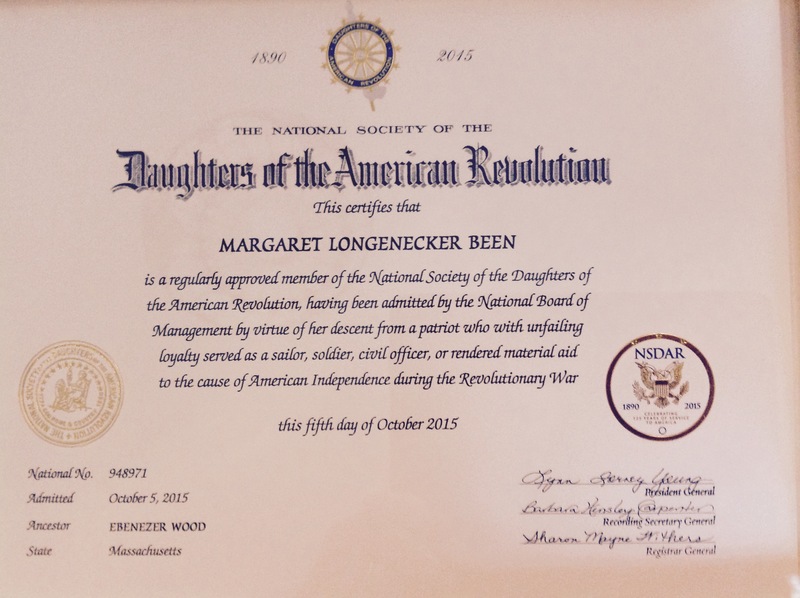 It finally arrived—my official document of membership in the Daughters of the American Revolution. Months ago I blogged about Solomon’s will which I procured from the State of Illinois Archives in Springfield, as a part of the vetting process. I have a favorite one-liner: “If we hadn’t won our American Revolution, we’d be speaking English! This is not meant only in jest. I have an ongoing feud with the way too many Americans have desecrated the priceless language of Shakespeare and Milton. Yikes, good grief, and a string of expletives which rumble in my head but, having been raised to be a lady, I simply cannot utter! “Her and me!” Come on! Hardly anyone would say, ” ‘Her‘ went to the store” instead of ‘she‘ “. And who in the world would say, ” ‘Me‘ went to the store” instead of ‘I’ ? Didn’t any third grade teacher drill into these word miscreants how to separate the pronouns into two sentences if there were any question of discerning object pronouns from subject? Examples: “She went to the store.” “I went to the store.” Therefore: “She and I went to the store.” DUH. Anyway along with English, American is spoken here and I’m happy to be descended from Farmer/Patriot Ebenezer Wood of Massachusetts. Maybe Patriot Wood scrambled his pronouns, and possibly some individuals across the pond in Britain do today as well. Scrambling in no way diminishes anyone’s value as a person created in God’s image. Language just happens to be a fetish of mine, yet I can also make mistakes. We are all in good company, as God was the original scrambler of language, at the tower of Babel. Recently Joe and I watched the PBS series on the American Revolution. 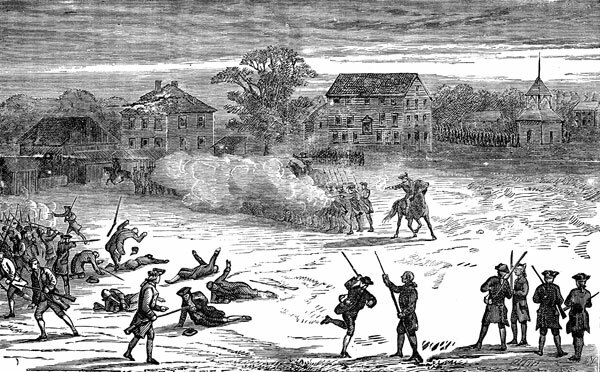 I learned a touching fact that I’d never considered before—how, especially in the Southern Colonies, the war was often Citizen Rebel against Neighbor Loyalist rather than army against army. Communities and sometimes even families were fractured in the fray. The PBS documentary stressed the poverty of the Continental Army which was high on patriotism and valor but absolutely destitute when it came to food, footwear, and ammunition. Except through direct intervention from God, all the valor in the world cannot prevail when an army is starving, barefoot, and empty-handed in the face of a well-trained, armed super-power! We all know that France came through with bonds to feed, clothe, and arm the rebels. But never—until recently when I came across his name in a book*—did I ever hear of Haym Salomon, the Jewish broker/financier who immigrated from Poland to America and literally financed the American Revolution by converting the French loans into cash by selling bills of exchange for the American Superintendent of Finance, Robert Morris. You can GOOGLE Haym Salomon, to learn more about this amazing man who along with George Washington can be called, “The Father of Our Country”. Not only did Salomon sponsor our nation with hundreds of thousands of dollars, but he contributed greatly to the Jewish community in Philadelphia—and he worked to end any vestiges of anti-Semitism in the Pennsylvania government. *The book that enlightened me concerning Haym Salomon is AS AMERICA HAS DONE TO ISRAEL, by John P. McTernan. My Great-Great Grandfather on my Mother’s side was named after one of ancient history’s wealthiest men, but Solomon Soper left a humble legacy: $50.00 to each of his four minor heirs. Actually that may have been a substantial inheritance back in 1843 when Mr. Soper died—but obviously not a fortune. I have difficulty reading the photocopy of Solomon’s personal goods listed in his will which I received from the Illinois Regional Archives Depository in Springfield, Illinois. Here are the items I can read: 1 two-horse wagon, 1 chopping ax, 1 iron wedge (or widge), 1 pot, 1 tea kettle, 1 pan, 1 pail, 1 pitcher, 1 plate, 2 mugs, 1 saddle/’bridle/reins, 1 tin box, 1 bed and bedding, 1 bag, 1 smoothing iron, 37 bushels corn, 1 curry comb—and that is all I can decipher. The ancestor splurge has been triggered because I’m in the process of joining the Daughters of the American Revolution. I’ve been asked why in the world would I want to do that—and the question has been posed with an underlying inference that maybe I’m some kind of a snob. Well, my Revolutionary ancestor was a Private in the Continental Army, so I’m not exactly descended from General George Washington. Since my Mother and Maternal Grandmother were members of the D.A.R., joining that organization has often come to mind. So when our Granddaughter, Nancy in L. A., decided to join, both her Mom (our Daughter, Laura in Washington State) and I agreed it would be fun. Along with the family connection the D.A.R. has appealed to me for it’s traditional stand on patriotism and the importance of our U. S. Constitution—both of which have been egregiously undermined by President Obama and his minions. Rather than grousing while watching the news (or maybe along with grousing!) I want to be involved in some tangible activity that reflects my values. Currently the D.A.R. sponsors projects and fund raisers to benefit our veterans—and that suits me just fine. So I have journeyed back four generations to get Solomon Soper’s will. Solomon married Phoebe Wood—the granddaughter of Private Ebenezer Wood. Solomon and Phoebe’s daughter, Electa Lusetta Soper, married Reverend Daniel Alexander Campbell—a Scottish descendent Yankee who pastored the First Congregational Church (really the first!) at Pine River, Wisconsin. These were the parents of my Grandma Kate—a woman whom I’ll always revere for her Scottish backbone, and especially for her love for the Lord. Meanwhile, I’m touched by the list of Solomon’s goods—truly a litany of basic things. I have far more than 1 plate, 2 mugs, etc. But I have no reason whatsoever to be a snob! Solomon’s will reminds me of that!